An oculus (plural oculi, from Latin oculus, 'eye') is a circular opening in the centre of a dome or in a wall. Originating in antiquity, it is a feature of Byzantine and Neoclassical architecture. It is also known as an œil de boeuf from the French, or simply a "bull's-eye". 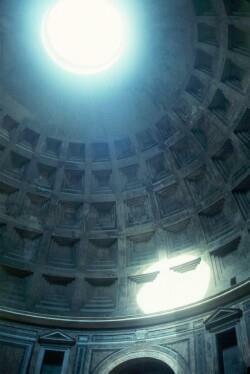 The oculus was used by the Romans, one of the finest examples being that in the dome of the Pantheon. Open to the weather, it allows rain to enter and fall to the floor, where it is carried away through drains. Though the opening looks small, it actually has a diameter of 27 ft (8.2 m) allowing it to light the building just as the sun lights the earth. The rain also keeps the building cool during the hot summer months. ^ a b c "Oculus window". Royal Institute of British Architects. Retrieved 24 January 2013. ^ "Oculus of the Pantheon", About.com. Retrieved 24 January 2013. ^ "The Cathedral of Santa Maria del Fiore, Florence". Retrieved 24 January 2013. ^ "Daylighting in two centroidal spaces at the University of Virginia: Case Study", The Rotunda and Caplin Pavilion: The University of Virginia. Retrieved 24 January 2013.